The Quebec government's proposed ban on the wearing religious symbols by public workers in authority positions extends far beyond police officers, judges and teachers, as the CAQ promised last fall, to a multitude of positions in the courts and the government. The Quebec government's proposed ban on religious symbols goes much farther than the Coalition Avenir Québec first suggested it would. 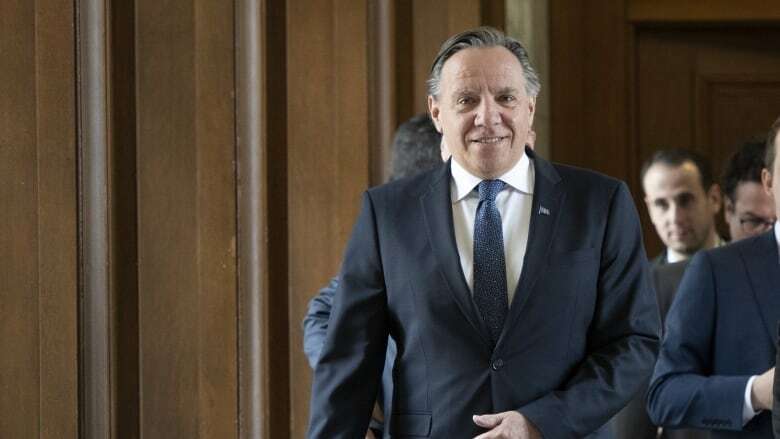 It extends beyond police officers, judges and teachers, as the CAQ promised during the fall election campaign, to a multitude of positions in the court system and government offices. Prof. Robert Leckey, the dean of McGill University's faculty of law, notes the draft legislation, Bill 21, extends beyond the recommendations laid out by the Bouchard-Taylor report, which advised applying the ban to public workers who hold "coercive" state power. "If the concern was that people would be afraid of bias when being disciplined by a state officer, it's way overbroad," said Leckey. Several municipalities and school boards have said they won't comply with the ban if it becomes law, but it's still not entirely clear what positions would be affected. Teachers, school principals and vice-principals in the public system. Under a grandfather clause in the legislation, those who already have a job are exempted from the ban, as long as they hold the same position at the same school board. Those working in private schools are not affected. Police officers, as well as any "peace officers who exercise their functions mainly in Quebec," according to the bill. The term "peace officers" is open to interpretation and will need to be more clearly defined before the bill becomes law. The mayor of the City of Westmount, Christina Smith, says she believes the ban would apply to officers working for a municipal security service. In the case of Westmount, Smith said the city will not comply with such a ban. RCMP officers working in Quebec would not be required to comply with the ban, according to a spokesperson for federal Public Security Minister Ralph Goodale, Scott Bardsley. Bardsley said Quebec does not generally have jurisdiction over the RCMP, the Canada Border Service Agency or the Correctional Service of Canada, as they are all federally regulated. Therefore, he said, "Quebec's Bill 21 would not apply to the uniforms of CBSA, RCMP or corrections officers." The provincial justice minister and attorney general, the Director of Criminal and Penal Prosecutions (DPCP), Crown prosecutors and provincial government lawyers or notaries employed by a ministry or the DPCP or the National Assembly. Other lawyers, including lawyers employed by a municipality, when acting as public prosecutors in a criminal or penal matter before a tribunal or when hired by a prosecutor. Lawyers or notaries before the courts who are contracted by a provincial ministry, the DPCP or the National Assembly. The ban also would apply to lawyers before the courts on contract to government commissions, when those lawyers are appointed by the National Assembly. Members and the heads of a long list of government commissions, including Quebec's rental board, the Régie du logement, Quebec's liquor board, the Régie d'alcool, the police ethics commission, the Commissaire à la déontologie policière, and the administrative labour tribunal, the Tribunal administratif du travail. The Speaker and Vice-Speaker of the National Assembly. Provincial court and municipal court administrative justices of the peace, clerks and sheriffs, including municipal court clerks. Other municipal clerks would not be subject to the ban. Commissioners, lawyers and notaries acting for provincial public inquiries. Arbitrators appointed by the Ministry of Labour.